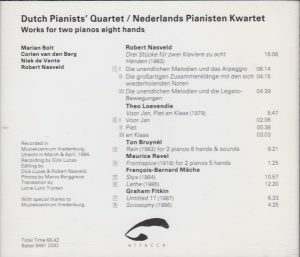 Dutch Pianists’ Quartet / Nederlands Pianisten Kwartet: Works for two pianos eight hands (Robert Nasveld: Three Pieces for two pianos eight-hands, Theo Loevendie: For Jan, Piet and Klaas, Ton Bruynèl: Rain for 2 pianos 8 hands & sounds, Maurice Ravel: Frontispice for 2 pianos 5 hands, François-Bernard Mâche: Styx, Lethe, Graham Fitkin: Untitled 1, Sciosophy). Attacca Babel 9481 (1994), no barcode. Rare CD from the Dutch label Attacca Babel, from 1994. It offers a fine recital of contemporary pieces for 2 pianos 8 hands, framing Ravel‘s classic, short (1:23) and haunting Frontispice for 2 pianos 5 hands. Other than the two pieces of Fitkin – very entertaining, but in essence repetitive, busy and motoric boogies – all manage to be both inventive in their approach to contemporary piano writing, never cheap and easy, never 20th century derivations of Rachmaninoff, but at the same time very atmospheric, never forbidding. The piano is so burdened by mighty 18th and 19th-century traditions that it is hard for a composer to liberate himself from them and invent new sounds from the old instrument. There’s a line going from Cowell to Crumb and Stephen Scott that did that by playing directly with the piano strings. None of this here, all compositions simply strike the piano keys in time-hallowed fashion, but apparently doing that with four times more hands than customary opens up great sonic possibilities. 8 hands are more here than the product of two times four. My favorites are those of the French François-Bernard Mâche – a neglected but, at his best, great composer, born in 1935, co-founder with Pierre Schaeffer of the Groupe de Recherches Musicales (GRM) and one of the main champions of mixing tape and acoustic instruments – and Ton Bruynèl – a name hitherto unknown to me, but obviously the Dutch Mâche (he was even born a year apart from Mâche, in 1934). Bruynèl‘s Rain, “an indoor rainstorm for four pianists on two pianos and a set of loudspeakers”, with its showering pianos and ebbing and flowing dynamics, is a wonderfully atmospheric and hauntingly beautiful piece thanks, precisely, to its mixing of piano and sounds. It’s on the occasion of the reposting of the review here, in October 2016, that I inquired more on Bruynèl and found out that he was very much inspired by Pierre Schaeffer’s Musique Concrète and a champion of mixing acoustic instruments and tape sounds (and a postscript from October 2016: and further I did explore, through the great Bruynèl tribute Looking Ears). Here’s a composer worth exploring further. Mâche‘s two pieces, Styx (1984) and Léthé (1985), inspired by the Underworld Rivers from the Greek mythology, for once don’t use tape. They play mainly on sound mass (pounding chords in the lower registers and fast repeated notes or arpeggios played all over the piano range by eight hands in polyrhythms and often in massively loud dynamics, blurring the sense of individual notes and creating halos of sound, make the instrument something else) and are hugely impressive, conveying the impression of a veritable sonic lava. 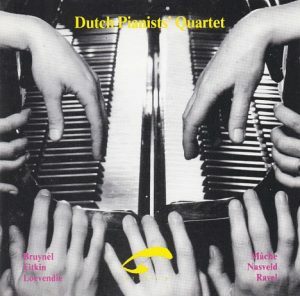 In Styx, through a combination of more resonant sonics and more powerful interpretation, the Dutch Pianists Quartet is more impressive than the French lady pianists who recorded Mâche’s music for piano and two pianos on Naxos, 8557988; there’s no clear-cut superiority of either in Léthé. Pianist Robert Nasveld, one of the members of the Dutch Pianists’ Quartet, is also a composer, and his Three Pieces from 1982 are fine too, tonally anchored, going against the grain of 20th century piano composition by developing, in the two outer movements, the legato qualities of the instrument and unfolding dreamy atmospheres using pedallling and resonance then rising to great climaxes, and playing on sonic mass like the pieces of Mâche in the central one then receding to appeasement in contrary motion. Attacca Babel is a small independent label from Amsterdam that has been (and is still) in existence since 1981, focused on contemporary music (with a few escapes in music of previous centuries), and each of its publications has been of interest. I was happy to find this one listed and sold on Amazon, since the fact that, still in 1994, the label didn’t use barcodes, makes listings improbable. TT 66:44.